FSIP offers a training and demonstration program either onsite or via a live web conference to demonstrate the effectiveness of the Xtender Battery Regenerator. The training period takes approximately 5- 6 hours and highlights how to operate and program the Xtender Battery Regenerator. 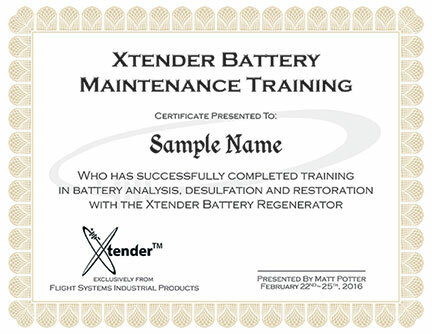 Throughout this process your staff will also become familiar with advanced battery technologies, the battery regeneration process and the battery health analysis reports automatically generated by the Xtender. Our wireless Battery Monitoring System (BMS), and all necessary accessories are included at no additional charge. At the completion of the training period, the demonstration unit remains onsite to perform further regenerations. The total time of the training and demonstration period is approximately two weeks, giving you ample time to perform multiple restorations on various batteries. Throughout the training and demo period, the number of batteries regenerated could potentially pay a good portion of the overall Xtender purchase investment. Certificates of completion are provided at the end of the training period. FSIP also offers an option to rent the Xtender Battery Regenerator. Renting an Xtender is a great option for customers that have a small number batteries that need to be restored, or for customers that may just have a seasonal need for battery restoration. Contact us today to schedule a demo at your facility!